Upgrade to the largest storage space in the 6-foot class - a big 6.3 cu. ft.! Flush mount makes this Norcold camper refrigerator roomy, convenient and user friendly.Reversible doors, convenient eye level LCD controls, and an energy efficient alarm to let you know if the door is open, all allow you the comfort of knowing you can save money while enjoying your RV trip. Embedded steel frame ensures long life by protecting from bending, scratching, and corrosion. 2-way Norcold RV refrigerators are powered by 120 volt AC and LP gas. Cut-out dimensions of the N641 are 52-7/8"H x 23-1/2"W x 24"D.
Attention:This unit operates on LP Gas on 110V AC, however a 12V power source is required for the control system. Note: All door panels are black and sold separately. 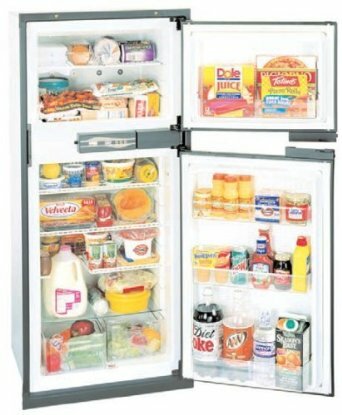 I have just purchased this unit and got it installed and this refrigerator is great! I bought it as a replacement in my motor home and the price was the best so I purchased it online from you folks. The Norcold is a great brand of RV refrigerator and I appreciate the great deal and will keep you all in mind.